The River Spey passes through Aberlour as it makes it’s way from the Cairngorms to Spey Bay. The village, Aberlour was founded at the mouth of the Lour burn which merges into the Spey. The river is world famous for salmon fishing attracting anglers from far and wide. The wildlife and landscape delight photographers and walkers and the water is also essential for the many whisky distilleries. 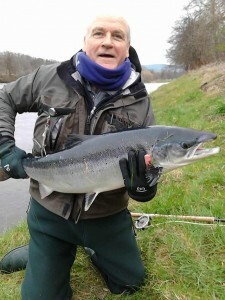 Salmon fishing can be arranged by visiting www.fishspey.co.uk and also on the village’s Association Water, with day tickets purchased using the email address aberlouranglingpermits@hotmail.com Permits can be picked up from the Aberlour Hotel, phone 01340871287. The waters provide excellent sport for the novice and seasoned angler alike and lessons for all standards of anglers can be arranged. You can try the the Munro Killer, or use one of your own flies to try and outwit the wily Spey salmon. Spey casting is hypnotic to watch, and you are welcome to sit on the bank or watch from the Victoria Bridge. Fishing Tackle sales and hire can be obtained from Spey Sport at 79 High Street, Aberlour from Brian Doran. It was decided at the AGM that the club would follow the Spey Board recommendations to return all fish until the end of May .